Does the instructor come across like a "pushy salesperson"? You are searching for an education, not a used car. You shouldn't feel pressured into joining. Stay clear of "pushy salesperson" instructors. Our school allows you to take all the information home to discuss with your family before making any decisions. We want to answer all of your questions so you can make the right choice for you and your family. Does the martial art style contain all the elements that I am looking for? 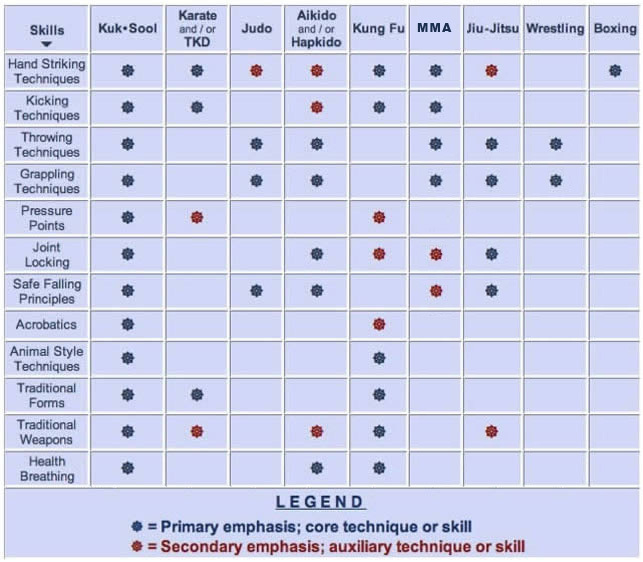 Take a look at this comparison chart to see the differences of some common martial art styles and what they offer. Kuk Sool Won™ covers all the aspects of the oriental martial arts and combines them into one system. Do I feel welcome? Get a feel for the atmosphere at the school. Talk to other students or parents. See what they have to say about the classes and instructors. Read some of the testimonies from students. Do I know who will be teaching the classes? The school may be owned by a high ranking master, but is that person going to be teaching the class? Find out who will actually be teaching the classes. At our Kuk Sool Won Martial Art Center, the school owner personally teaches and oversees all of the classes, because he is passionate about what his students are learning. Is the instructor actively learning and training? This may not seem very important at first, but once you or your child has reached black belt, this becomes extremely important. If your instructor is only 1st or 2nd degree black belt (1st degree is lowest - 9th degree is highest), then how will they teach you after you or your child reach black belt? Many times, students find that once they get their black belt at such schools, their learning slows down to a stop and all that is left for them is the same old exercises over and over again. Kuk Sool Won™ has a standardized black belt curriculum that it follows, which is upheld by the World Kuk Sool Association® (WKSA®). Our Head Instructor travels to the WKSA® headquarters every year for further instruction and correction from the most knowledgeable martial arts masters in the world. Do I want my child to be like this instructor? This is one of the most important things to consider. This is the person that will be molding and shaping you or your child into the person you want to see. A martial arts instructor has a very influential role in each student's life. If you don't feel good about the instructor, then you don't want your child learning from him/her. These questions should keep you from making a mistake by choosing the wrong martial art school. A martial art school is not just an after school program, or a summer program. It is a long term investment in the future of you or your child. You should be thoughtful and intentional in choosing the one that will allow you or your child to reach their fullest potential. If you have any questions, feel free to call 810-908-2659 to speak with Head Instructor Kenneth A. Wright directly or email him at kwright@kuksoolwon.com.